A while ago when I reviewed Kerbal Space Program and gave it five out of five, I asked rhetorically What is more fun than to build your own rocket, crew it with a trio of little green men, and launch it into outer space? . Little green men. Little green men. That's a problem. What not to suggest[b] on the Suggestions and Development Discussion[c] forum. 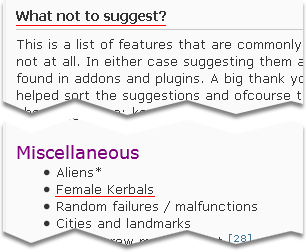 'Why are you wasting time making female kerbals?' Ask your girlfriend/mom. Seriously, ask them if they think its a waste of time. Unless your gf or mom hate videogames. In which case it's all a waste of time. Like sure, the original idea was for them to be genderless, like... Pikmin or something. Then we called them Jeb, Bill and Bob. And we gave them strong jaws and a widow's peak. Like the Christian God when playing with clay, we accidentally made man.
.@b_mcnett That's pretty much it. We goofed. Are fixing it. Ended up being more work than we thought but it's cool. And you're like 'ah, crap'. Space is for everyone. 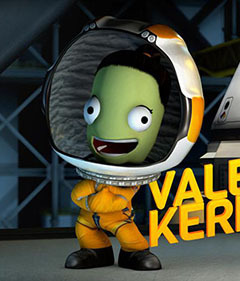 And if in the end we get one girl to just not quit on liking math and science because of Valentina Kerman, worth it. I wonder if they, like me, have been affected by GamerGate. The suffering it has caused cannot have been overlooked by anyone, and I'm sure it has made a lot of people more aware of gender issues even if they haven't directly engaged in the conflict. Out of sight is out of mind, and if there is anything that GamerGate hasn't been it is out of sight. Either way, I wholeheartedly welcome Valentina Kerman, named after Valentina Tereshkova[l], and her sisters to my instances of the Kerbal Space Program! The best way to break through glass ceilings is an external command seat and a good booster. Spaceplane in orbit around Laythe, moon of the gas giant Jool.